Sandia National Laboratories and Lewis Rhodes Labs have introduced a new cybersecurity tool called the Neuromorphic Cyber Microscope. The system is not a traditional microscope per se. It is a PCIe-based processing card build around Lewis Rhodes Labs’ neuromorphic processor. The system can accelerate complex pattern matching by over 100x while using 1,000x less power per operation. Originally conceived by engineering guru Carver Mead in the 1980s, neuromorphic computing and its previous incarnation, artificial neural networks, make use of specialized chips that are inspired by the computational functions of the brain. Basically, neuromorphic chips are fast pattern-matching engines that process the data in the memory. In theory, these chips promise to enable systems that can perform several tasks, such as computer vision, data analytics and machine learning. The Neuromorphic Cyber Microscope from Lewis Rhodes and Sandia solve a major problem—cyber attacks are out of control. According to Lewis Rhodes Labs, cyber defense is a three-stage process. “First, intrusion detection systems (IDS), monitor network and system activity for malicious events. IDSs use hardware and software sensors to execute security policies describing these events to generate alerts. Second, the alerts are consolidated into a security management system. Finally, highly trained security analysts evaluate the alerts using experience and a variety of analytic tools to identify and neutralize threats,” according to Lewis Rhodes Labs. “This model is increasingly compromised by the high cost of detection. Cost limits the number and fidelity of operational sensors leading to a marked deterioration in the quality of alert data. In practice, the vast majority of alerts consist of false positive indicators placing a huge burden on the security analyst,” according to the lab. Conventional cyber-detection systems sequentially match small chunks of data against a library of nefarious patterns, a system that is not efficient. In contrast, the Neuromorphic Cyber Microscope compares streaming data to suspicious patterns in a time-dependent manner. Using this technique, the neuromorphic system is faster than racks of traditional systems. “This completely changes the way that we look for suspicious activity without running the risk of overwhelming our analysts with too much information,” said Roger Suppona, a cybersecurity expert at Sandia. A new European project plans to develop a next-generation, high-resolution optical microscope based on the world’s smallest LEDs. The project, called ChipScope, is led by the University of Barcelona. The group also includes Braunschweig University of Technology, the University of Rome Tor Vergata, Expert Ymaging, the Austrian University of Technology, the Medical University of Vienna and the Swiss Foundation for Research in Microtechnology. The 4-year project, which has 3.75 million euros in funding, is part of the Future and Emerging Technologies (FET Open), a European program focused on developing breakthrough technologies. Today’s microscopes have imaging limits around 200nm. The goal of the European group is to develop a new microscope that goes beyond the diffraction limit. The goal is to image tiny structures, such as viruses, DNA molecules and cells. The group plans to devise tiny LEDs at about 50nm. The so-called nanoLEDs will be the light source for the new microscope. The devices will be spaced at nanometric distances in a matrix. When the system is on, a sensitive photodetector will detect signals in real time. This, in turn, will enable fast imaging. The first tests with the new microscope will be done with cell samples of idiopathic lung fibrosis. 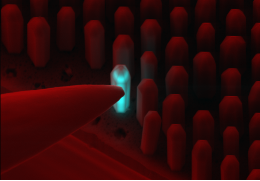 “The theoretical base of the project was already thought of in the sixties, but in order to work on those ideas, they needed microchips, LEDs and the ability to build those nanometric-sized objects and place them in order,” said Daniel Prades, member of the Research Group Micro-and-nanotechnologies for Electronics and Photonics (MIND), which is also part of this project. “Having a microscope of this size will provide the opportunity of measuring things in conditions that were impossible so far. This technology will set new science up, since it will enable creating new experiments, such as observing places you could never get into with an optical microscope,” Prades said on the university’s Web site.